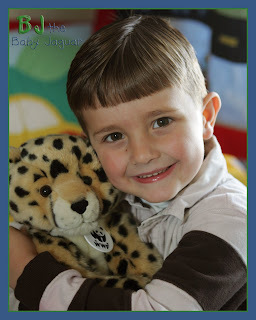 Trevan is pleased to announce the addition of a new Build-A-Bear Buddy to his growing crew. 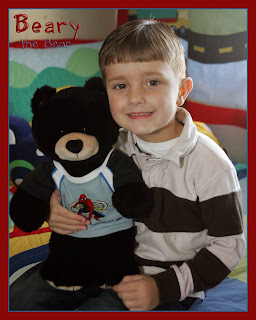 He went to his best friend Hudson's Birthday Party last week at Build-A-Bear and brought home this cute, cuddly guy... Beary the Bear. Beary wears a Spiderman T-shirt JUST like one of T's Pajama shirts and is rumored to have super-powers. 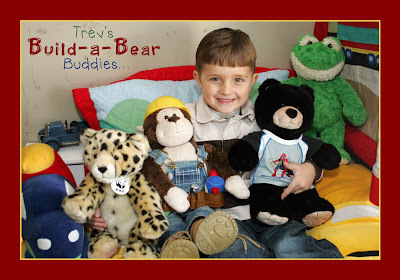 Trev's first Build-A-Bear, Mo the Monkey, was his favorite Night-time Pal for several years. We got him on vacation in southern California in the Summer of 2004 and T has LOVED him ever since! 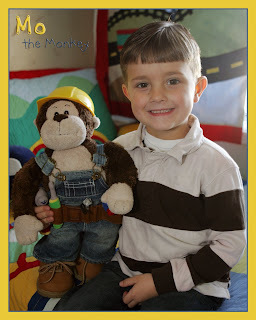 Kaden gave Trev Mo's awesome construction outfit for Christmas last year. 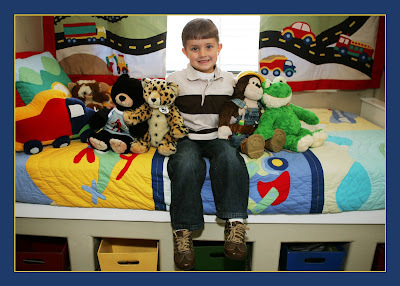 Now he "matches" in Trev's Transportation-themed Bedroom. 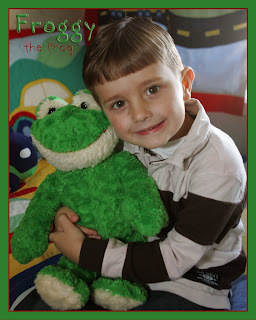 Trevan adopted Froggy the Frog from Alli, our babysitter/psuedo-daughter when she started High School and got too busy to take care of Froggy. Wow! He has alot of nice friends there!! And he looks SO handsome in all of those pictures! Did you have a pro take them?? ;) Good Job Sara! Its wild to see how fast he's growing up. I need to come over and take like a crash course in Photoshop or Illustrator, whatever you're using to spiffy up these already amazing pictures! LOVE IT!